Construction crews were on site Friday morning at the Silver Creek water reclamation facility, located on about 40 acres east of the U.S. 40 and Interstate 80 junction. The nearly $51 million expansion and upgrade is slated to be completed in the fall of 2019. 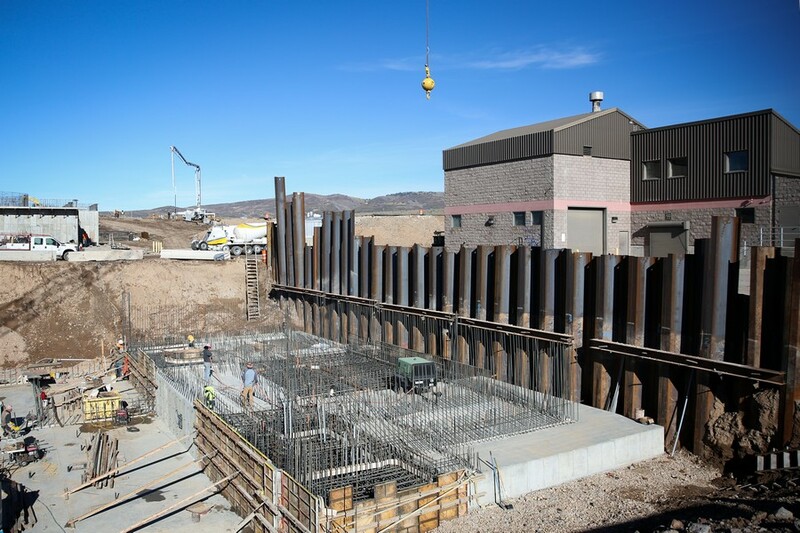 Construction crews and heavy machinery have been on site at the Silver Creek water reclamation facility since April, marking the beginning of one of Summit County’s most expensive public works projects, according to Snyderville Basin Water Reclamation District General Manager Mike Luers. The nearly $51 million expansion and upgrade of the Silver Creek water reclamation facility will turn the plant into an advanced wastewater treatment facility, capable of handling 4 million gallons of wastewater a day. Luers said the project is slated to be completed in the fall of 2019, with construction and demolition of the current facility occurring simultaneously. “This project, from the day we said we needed more capacity to the day we flip the switch, is going to take five years,” Luers said. “The design of this project took more than a year because you have to tear down the current facility and rebuild it without ever interrupting service or creating any environmental concerns. The Snyderville Basin Water Reclamation District provides wastewater collection and reclamation services to approximately 11,000 homes and businesses within 102 square miles in Park City and the Snyderville Basin, according to the district’s website. The district operates and maintains two reclamation facilities, 12 pump stations and more than 260 miles of pipelines. However, the Silver Creek facility is expected to run out of capacity as the community continues to grow, Luers said. The facility currently handles 2 million gallons of water a day. Environmental studies have revealed that Silver Creek and several downstream reservoirs, particularly Echo Reservoir, show the presence nutrients such as phosphorus and nitrogen in the water. High levels of the nutrients degrades water quality and reduces oxygen levels for fish populations. “It comes from all of the growth up here and so now we are having to put in advanced tertiary treatments to take all of that out,” Luers said. The East Canyon water reclamation facility, which was upgraded in 2003, is currently the only facility in the state capable of removing phosphorus from wastewater. The new Silver Creek facility will operate similarly. “We will be removing nutrients, especially phosphorus, to very low levels like we are doing now down at the East Canyon facility,” Luers said. Last year, the district sold approximately $20 million worth of revenue bonds to fund the project.